The Media Institute of Southern Africa (MISA) Zambia says it ‘is horrified at the statement attributed to Movement for Multiparty Democracy (MMD) Lusaka Province Chairperson William Banda, in which he is reported to have vowed to “fight” and “defeat” The Post newspaper, for allegedly insulting President Rupiah Banda, Vice-President George Kunda, and a number of cabinet ministers’. In a news release to the Watchdog MISA Zambia said, “Perhaps Mr. Banda said this out of ignorance of the law, and if that is the case, we appeal to his superiors in the MMD, including President Rupiah Banda, to immediately check the excesses of this senior cadre, who has a reputation of thuggish behaviour, dating back to his days as Lusaka District Governor, under the former ruling party, the United National Independence Party (UNIP). “We would like to remind Mr. William Banda that the days of UNIP-style vigilantism ended with the abolition of one party rule in 1990. Perhaps he has forgotten his history and is living in the past? If that is the case, we would like to urge him to check his calendar again and realise that this is the year 2010 and not 1990, when UNIP was desperately fighting the tide of political change, and Mr. Banda was in the forefront of defending UNIP’s desperate hold on power. 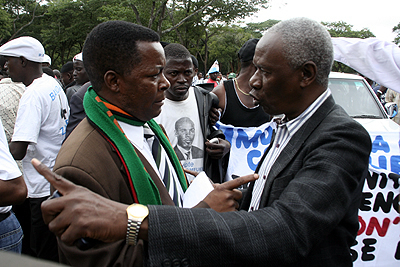 “We are now in the 21st Century and not the 20th Century, where Mr. William Banda cut his teeth in politics and was well schooled in using violence to crush political opponents, including the media. Such tactics are not acceptable in a multiparty democracy like Zambia is today, and has been for the last 20 years since former president Dr. Kenneth Kaunda abolished one-party rule. “In light of the above, we would like to reiterate our appeal to the MMD leadership, including President Banda, to please counsel Mr. Banda and urge him to change his old fashioned ways, because they are tarnishing the image of the country as an oasis of peace, political tolerance and freedom of the press.